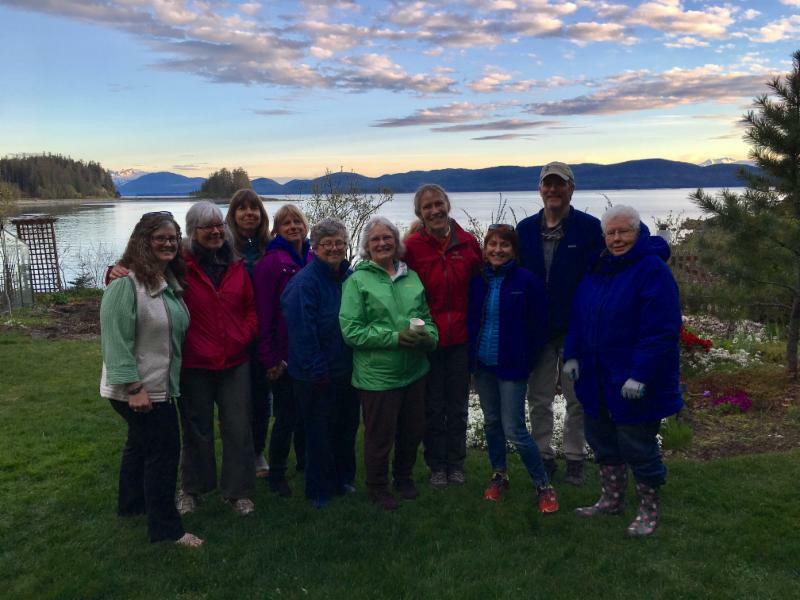 With great pleasure, the Arboretum announces its inaugural cohort of volunteer docents, ready and willing to greet you and answer your questions. 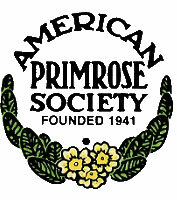 Volunteer docents are common to many public institutions...botanical gardens, museums, and galleries, among others. 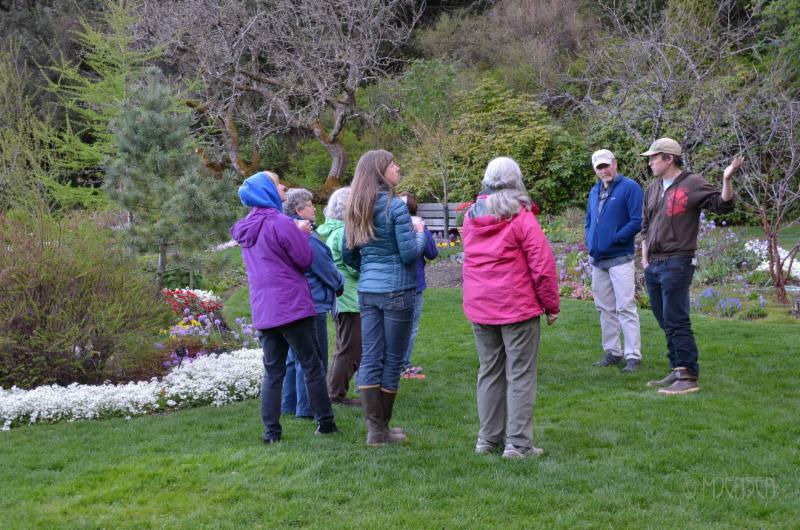 The word docent means "to teach or guide" and JOA docents have recently participated in a 4.5 hour training session in order to do just that - teach visitors and guests about the many facets of the Arboretum. 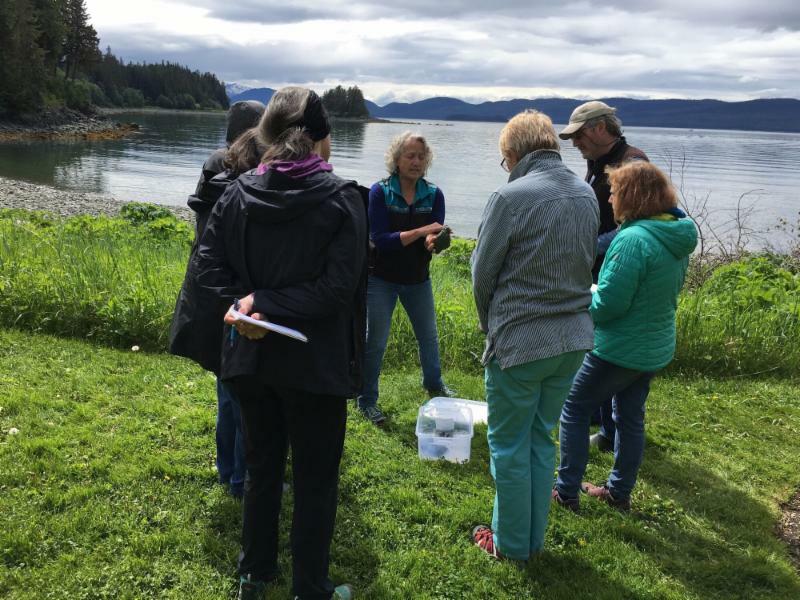 Each docent agrees to volunteer a minimum of 8 hours time over the course of the season serving as greeter, question-taker, policy enforcer, and general source of information. 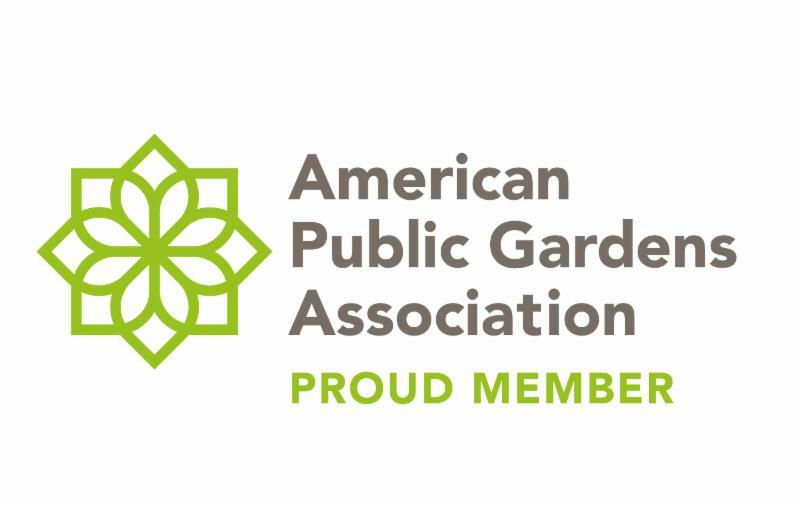 Look for them throughout the Arboretum (hint: they'll soon be wearing sporty docent vests) and offer them your thanks for their service and their willingness to spend time learning more detailed information about the Arboretum, its plant collections, its history, and its ecosystem, so in turn, they can share their knowledge with others and enhance the overall visitor experience. 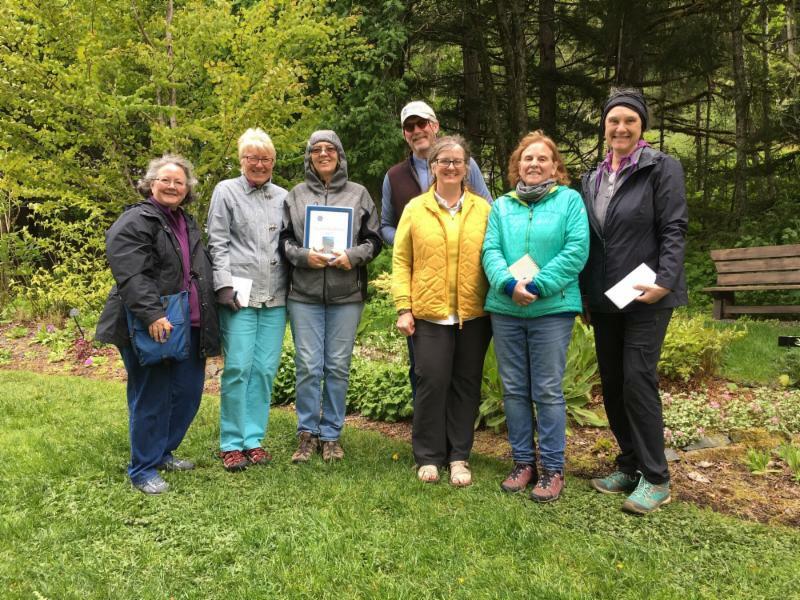 An historic moment: Jensen - Olson Arboretum's first-ever docent to welcome visitors, Patricia Wherry greeted approximately 60 visitors on her first day. 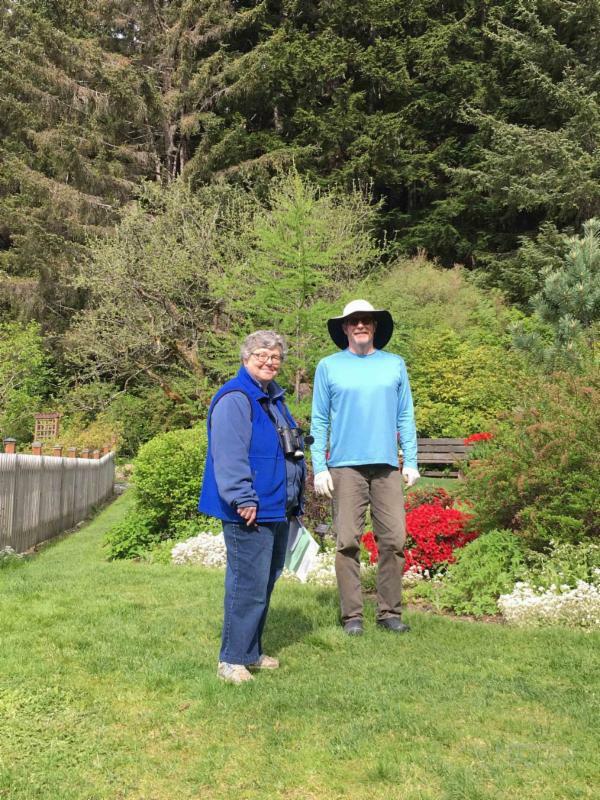 She is pictured here with Merrill Jensen, Horticulturist and Arboretum Manager. UAS Assistant Professor of Forest Ecology, Brian Buma, and UAS Professor of Biology, Sherry Tamone each volunteered their time to offer one section of docent training - the forest ecosystem surrounding the Arboretum and the inter-tidal ecosystem which is such a part of the Arboretum's identity. Thank you Brian and Sherry for sharing your time and expertise in support of our new docents! Commemorative bricks installed by expert volunteer - thank you! 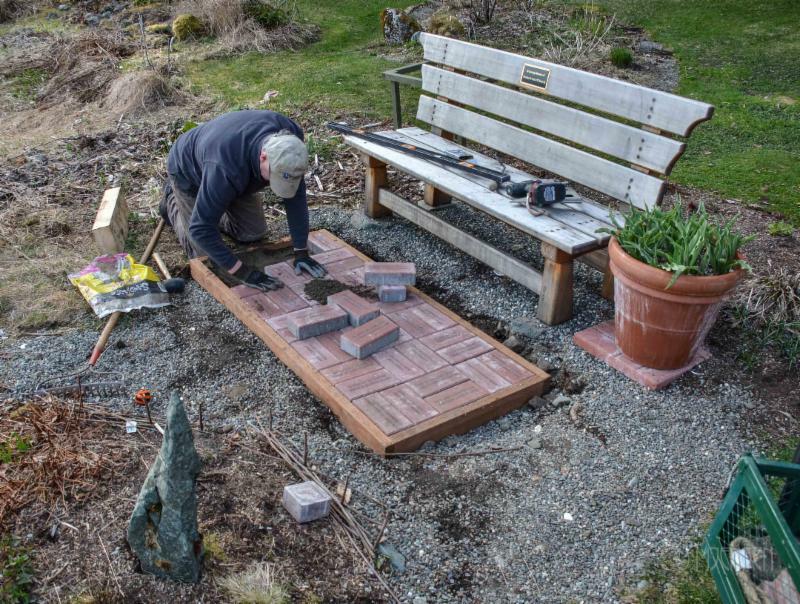 On a sunny Saturday in April, Bill Ehlers together with his grandson, spent several hours at the Arboretum installing our most recent order of commemorative bricks. You may remember Bill as one of the seasonal gardeners during the first years of the Arboretum’s history as a public garden. 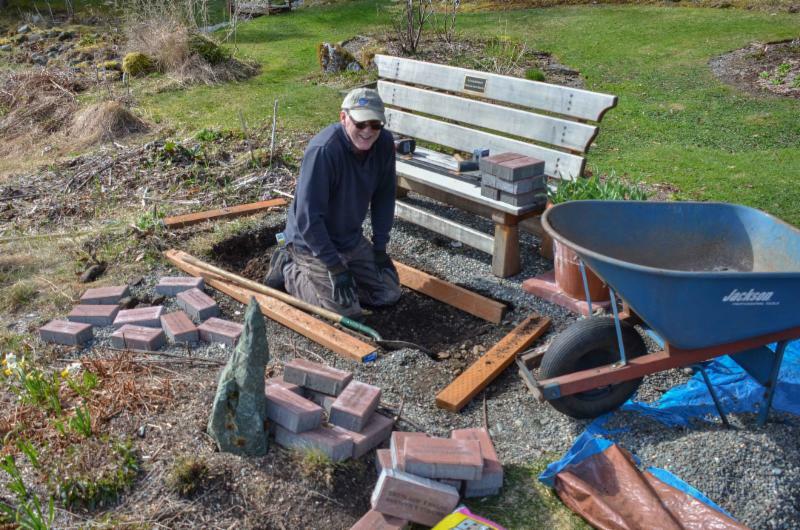 More recently, we have come to depend on Bill’s willingness to volunteer and his significant expertise in brick-laying – thank you, Bill for sharing your Saturday time with the Arboretum. We have another set of bricks to install and hope to have those in place (location still to be determined) later this year. Until then, please come and enjoy this new addition to the landscape of the Arboretum. 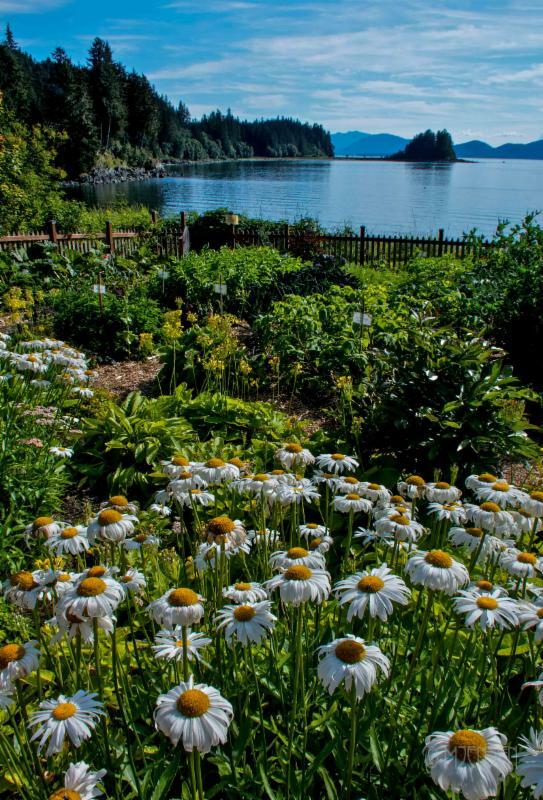 Saturday, July 15th the Southeast Alaska Land Trust, in partnership with The Canvas, will host its 3rd consecutive painting workshop at the Arboretum. Taking inspiration from the ocean side setting, participants will get creative and learn to paint using oils. A morning and afternoon session are offered and all details can be found here. Please pardon our messes; we are working to improve and enhance the visitor experience. Honest! 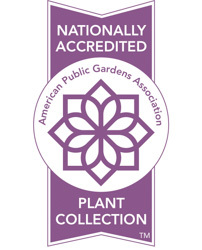 With funding from various sources, including the CBJ 1% sales tax initiative as well as monthly rental income from the manager's residence, improvements include construction of a small parking lot and also repair to the sunroom which is used for seed starting and staging of plants to be added to the collection. Projects are slated to begin in mid-late Summer; the sunroom repair and parking lot construction will be complete by Fall. Also included is a new entry to the Arboretum accessed via a path from the new parking lot, but that will likely not be complete until Spring 2018. Updates and timelines are regularly posted on the kiosk for your reference. 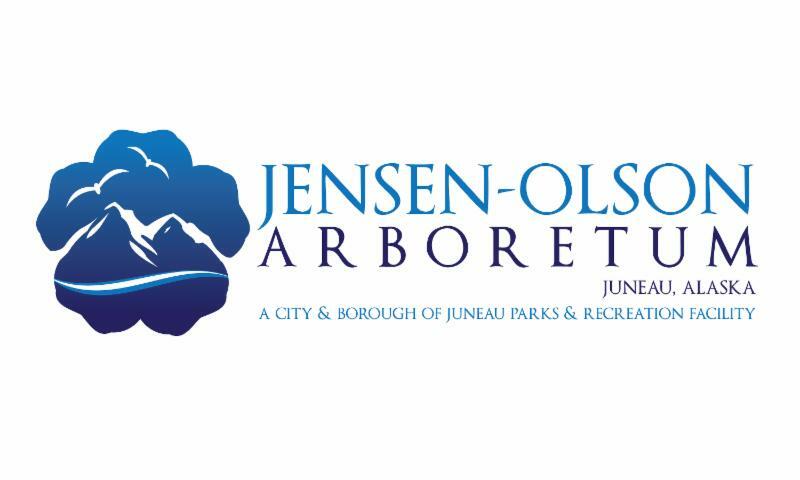 In late July 2007, the Jensen - Olson Arboretum celebrated its opening year with a ribbon-cutting, refreshments, and lots of plans for a full and successful future. Honoring Caroline Jensen's vision and legacy in these first 10 years has been a joyous responsibility. On July 29, 2017, the Arboretum will host a 10th Birthday Party to thank you for your support, with festivities throughout the day. Look for details to come in a separate mailing to your Inbox next week, but be assured, we'll have kids activities, a dignitary or two, cake and ice cream, and lots of reminiscing and laughter, so join us, won't you? 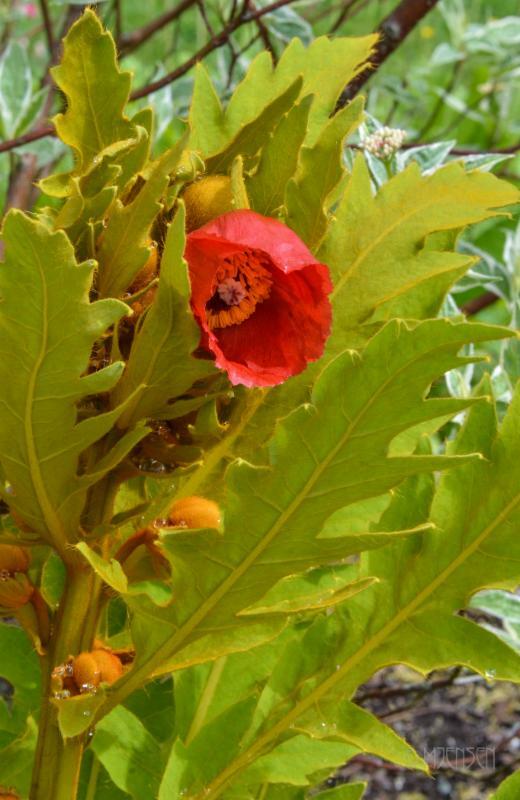 Q: How many different Meconopsis do you have at the Arboretum? 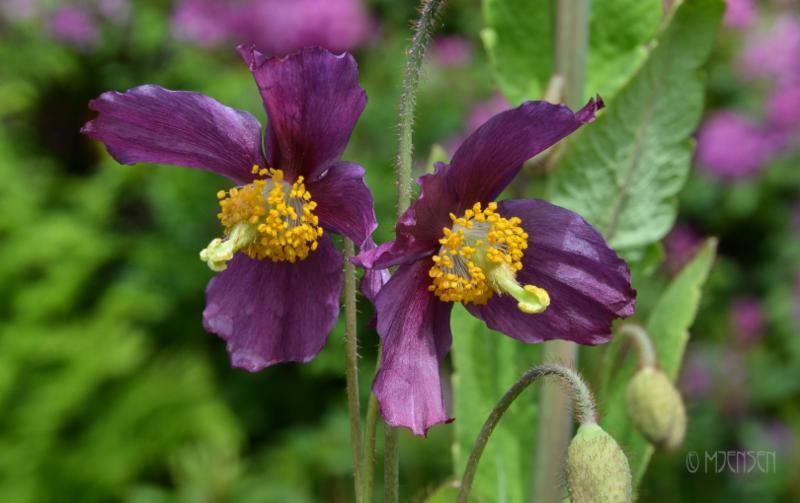 A: Known also by their common name, Himalayan Poppy, the Arboretum currently holds 15 different species and cultivars of this genus in its accessions . 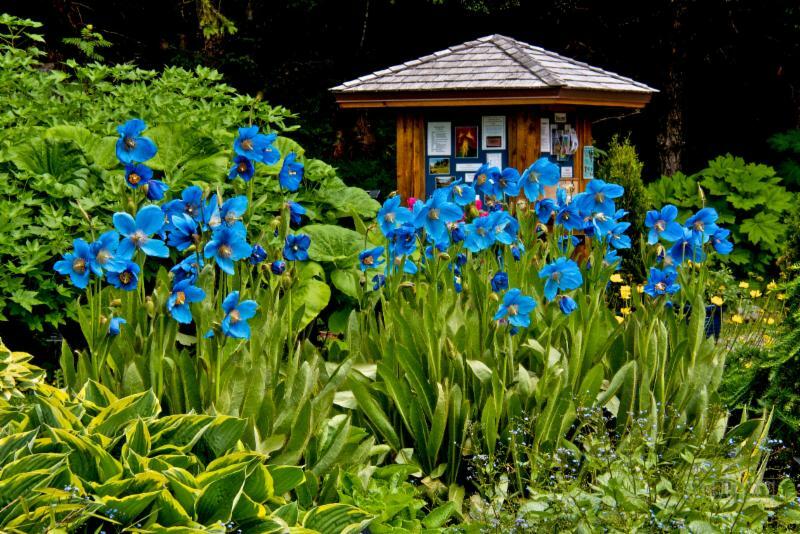 And while the well-known, brilliant blue is the most highly coveted, flower colors of Meconopsis here at the Arboretum include white, yellow, pale purple, and sockeye red. 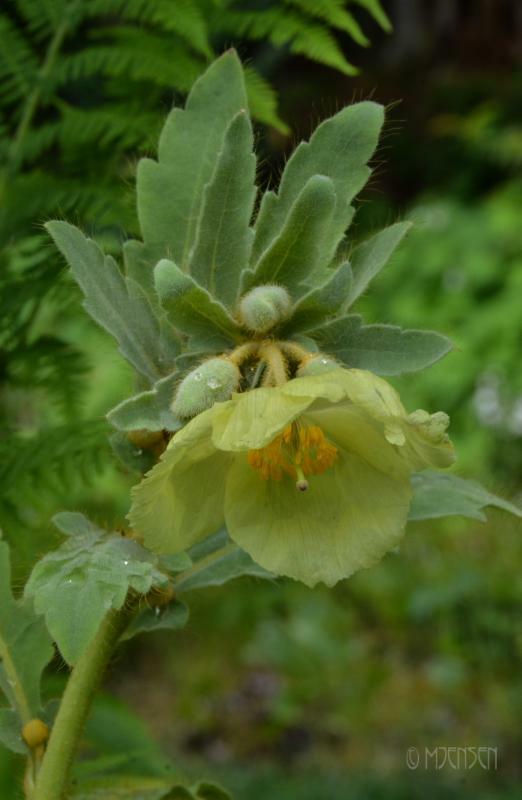 The Arboretum is a member of The Meconopsis Group, an affiliate of the Scottish Rock Garden Club; our membership affords us the benefit of seed exchange and first choice of seed availability...such a beguiling genus!